AOML and CARICOOS are carrying out sustained and targeted ocean observations with underwater gliders to enhance our understanding of air-sea interaction during Atlantic hurricanes. This project consists of two components to monitor the western boundary currents in the subtropical Atlantic: the Florida Current transport measurements using a submarine telephone cable plus calibration cruises and the Deep Western Boundary Current transport and property measurements using dedicated research ship time and moorings. Maintain a global 5x5 degree array of ~1300 satellite-tracked surface drifting buoys. Provide a data processing system for scientific use of these data. The global eXpendable BathyThermographs (XBT) network consists of global ocean transects where XBTs have been deployed for more than 50 years to collect temperature profiles of the upper ocean to mainly monitor ocean current variability, heat transport, and heat content. 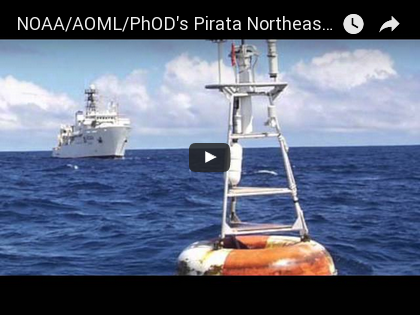 The PIRATA Northeast Extension (PNE) project is a joint AOML and PMEL effort to expand the PIRATA array of tropical Atlantic moorings into the northern and northeastern sectors of the Tropical Atlantic Ocean. Argo is an international program dedicated to obtain ocean profiles in real-time. AOML hosts the US Argo Data Acquisition Center and provides platforms for float deployments. Interbasin Differences in the Relationship between SST and Tropical Cyclone Intensification. What caused the accelerated sea level changes along the United States East Coast during 2010-2015? ENSO influence over the Pacific North American sector: Uncertainty due to atmospheric internal variability. Teleconnection between the Atlantic Meridional Overturning Circulation and sea level in the Mediterranean Sea. Seasonal patterns in phytoplankton biomass across the northern and deep Gulf of Mexico: A numerical model study. Trade Wind charging and ENSO predictability. The role of windage in the North Atlantic surface circulation. Reconstruction of Submesoscale Velocity Field from Surface Drifters. Observing System Experiments for the 2017 and 2018 Atlantic hurricane seasons. The impact of remote forcing on US summer temperature extremes. 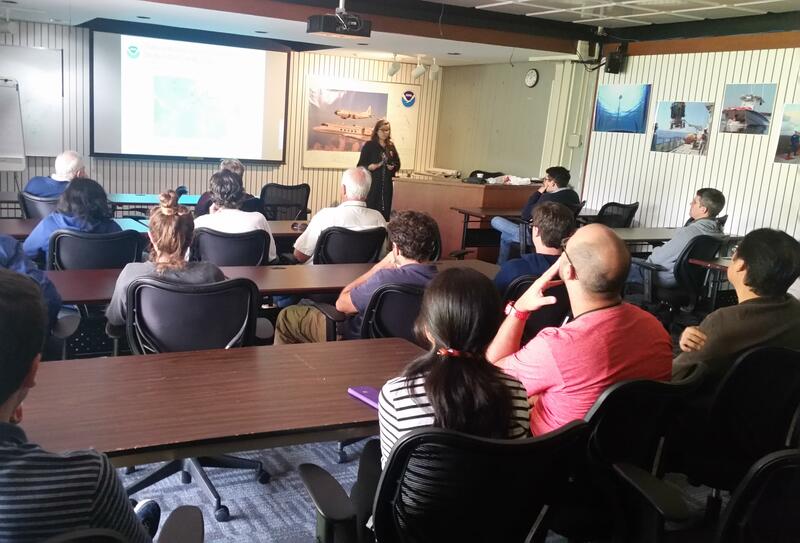 The Physical Oceanography Division at NOAA/AOML routinely receive applications for internships to carry out work on ocean sciences and/or engineering projects for periods that extend from one week to a few months. If you are interested in receiving more information about this type of opportunities, please contact Dr. Gustavo Goni (Gustavo.Goni@noaa.gov) or Mr. Ulises Rivero (Ulises.Rivero@noaa.gov). Postdoctoral Associate - Please let us know if are you interested in joining our team as a Postdoctoral Associate working on a field of research closely related to our divisional objectives. You may contact Gustavo Goni for additional details. For questions regarding these CIMAS positions, please contact Gustavo Goni at (305) 361-4339.